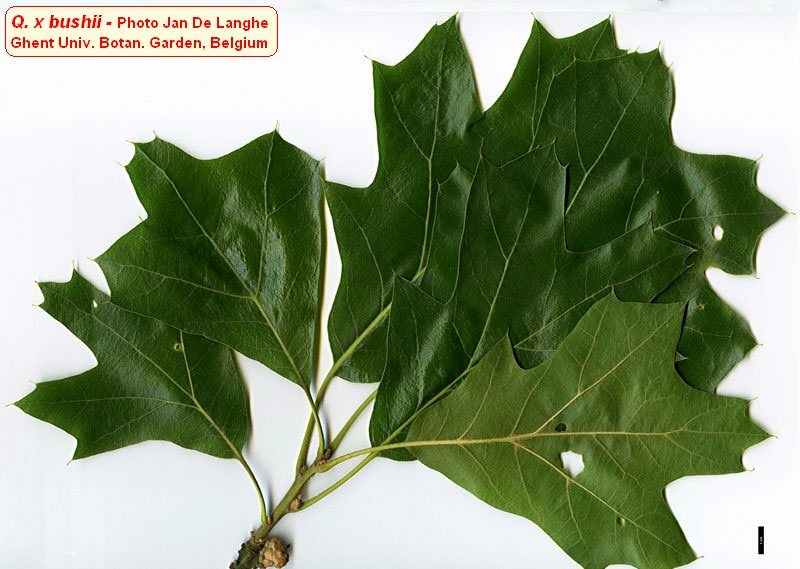 Quercus x bushii.Jan De Langhe.Ghent Univ. Botan. Garden. Belgium.oaks.of.the.world.free.fr. (Accessed 9/2014). Quercus x bushii is a tree to 9 m tall. Twigs stout, densely hairy when young; winter buds 1 cm long. Leaves Alternate; red oak group (subgenus Erythrobalanus), more like Q. marilandica than Q. velutina; stalk 3 cm long, blade 10-13 cm long, egg-shaped, widest near tip, 3-7 lobes; shiny dark green above, slightly yellow-hairy below; base rounded to wedge-shaped; fall color bright (Hélardot 2015). Flowers: monoecious, males in catkins. Fruit: Acorn egg-shaped, cup covering half; cup scales large, loose. Frequency in NYC: Rare but not listed. Habitat: Tolerant of a wide range of soils.